I'm delighted to be part of Ani once again, being one of the sought-after literary anthologies which is published by the Cultural Center of the Philippines annually. I have missed out contributing my work in the past years. Truly, this is one event celebrating the power of words and the richness of our literary heritage. The others who are also included in this anthology are literary friends, co-fellows in national writers workshops, co-faculty/ colleagues, teachers and writers whose works I admire. The Cultural Center of the Philippines (CCP) Literary Arts Division will launch Ani 35, The Pinoy as Asian issue, on November 26, 2009, 5:00 p.m., at the CCP Ramp with some of the featured authors reading from their works. 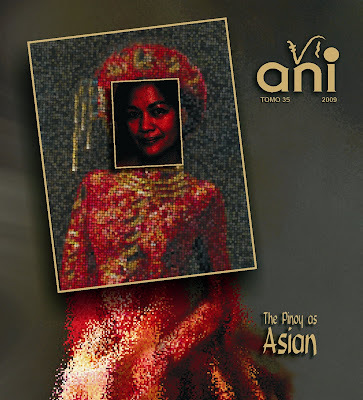 “Ani 35 is devoted to writings by Filipinos on their interaction with other Asian peoples and cultures. This may be interpreted as a response to the call of Dr. Bienvenido Lumbera, National Artist, on the need to reconnect with Southeast Asian literary tradition if we are to survive in this age of globalization,” Herminio S. Beltran, Jr., Literary Arts Division chief and editor of the publication, wrote in the Introduction. “We hope this will inspire the birthing of mechanisms and eventually practices in the Philippine literary/publishing world that will start off a more dynamic interaction among Filipino writers and their counterparts in the Asian continent,” Beltran continued. Ani 35 features 54 authors who contributed for three sections: poetry; prose (essay and fiction) based on the The Pinoy as Asian theme and; Malayang Haraya for poetry and prose contributions outside the theme. The 54 authors included in Ani 35 are Mark Angeles, Lilia F. Antonio, G. Mae Aquino, Genevieve L. Asenjo, Abdon M. Balde, Jr., Janet Tauro Batuigas, Gil Beltran, Herminio S. Beltran, Jr., Kristoffer Berse, Jaime Jesus Borlagdan, Raymond Calbay, Catherine Candano, Nonon V. Carandang, Christoffer Mitch Cerda, Joey Stephanie Chua, Kristian S. Cordero, Genaro R. Gojo Cruz, Carlomar Arcangel Daoana, Arvin Tiong Ello, Dennis Espada, Rogerick Fontanilla Fernandez, Reparado Galos III, Dr. Luis Gatmaitan, Joscephine Gomez, Malou Jacob, Ferdinand Pisigan Jarin, Karla Javier, Phillip Kimpo, Jr., Ed Nelson R. Labao, Gexter Ocampo Lacambra, Erwin C. Lareza, Jeffrey A. Lubang, Glenn Sevilla Mas, Perry C. Mangilaya, Noahlyn Maranan, Francisco Arias Monteseña, Ruth V. Mostrales, Victor Emmanuel Nadera, Jose Velando Ogatis-I, Wilhelmina S. Orozco, H. Francisco V. Peñones, Jr., Scott Magkachi Sabóy, Judith Balares Salamat, Edgar Calabia Samar, Louie Jon A. Sanchez, Soliman Agulto Santos, Dinah Roma-Sianturi, Rakki E. Sison-Buban, Jason Tabinas, Vincent Lester G. Tan, Dolores R. Taylan, Rosario Torres-Yu, Betty Uy-Regala, and Camilo M. Villanueva, Jr.
For issues of Ani, please contact the CCP Marketing Department at (632) 551-7930 or 832-11-25 locals 1800 to 1808. For authors who want to contribute for the next issue of Ani, please contact the CCP Literary Arts Division at 832-11-25 locals 1706 and 1707, or email aniyearbook@yahoo.com. This event also appeared in Panitikan: Your Portal to Philippine Literature and Boy Abunda's column, Directline (Philippine Star).